In the past week, I have been riding my bike to cross train for the lost time of not being able to run because of my injury (I had an ITB Syndrome, thougth it was a knee injury). During my ride, i felt improvement in my uphill training. Each day i cut down a minute of my time. I felt stronger and better. Good thing that I can cross train as it helps build my stamina, improves leg power, and of course it compensate for my weight loss program. Feeling better and no more pain in the knee, i took my running shoes, geared up and took a run in the village last night. 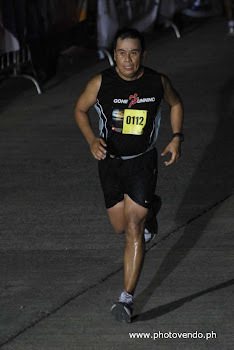 I was very conscious while running thinking that i will feel the pain in my knee area again. My breathing was perfect, felt strong and thought of finishing a 10k run. But, learning from my past mistake, I did not push myself and instead finished a 5k. I am back to zero for my running, but that's ok 'cause I will catch up with it. Good thing, when i was down from running, I was improving with my biking. An injury should not stop us from achieving our objective. In fitness, there are a lot of ways to recover lost time in your major fitness program. If you can't do running, you can do biking, if you dont have a bike, you can go swimming, if you are not into swimming, you can do walking.. If you can't do any of these due to the nature of your injury or illness, you simply just have to rest and get better. Sometimes its better to take 2 steps backward, so that you can move one step forward until you achieve your goal. Stay healthy and keep on training.